The Palladian-styled St. Leonard’s Church Shoreditch, immortalized in the old nursery rhyme Oranges and Lemons – “when I grow rich, say the bells of Shoreditch” – proved to be the perfect setting for this mightily impressive double-whammy of a concert. The 40 or so voices of the Element Choir directed by Canadian Christine Duncan, visiting the UK for the very first time, and the smaller MAKE Ensemble positively glowed in the heavenly acoustic of this ancient, crepuscular holy place. The text of Weston’s project derives from 52 nuggets of wisdom spoken by inspirational women from medieval times to the modern age – an eclectic mix of individuals including saints, sinners, singers, visionaries, poets, authors, composers, patrons of the arts and political activists. Each quotation has the word “make” in it. The concert was neatly divided into four parts. The outer frames were occupied by the Element Choir, Parts 2 and 3 by “MAKE”. 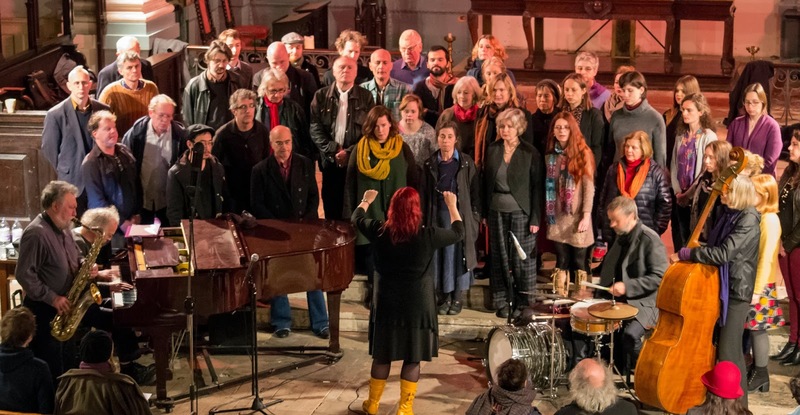 Unlike the pre-composed, non-improvisatory “MAKE” with its strict use of closely-related pentatonic scales, the music of the Element Choir was totally improvised – and what gloriously colourful and dynamic improvisations they turned out to be ! With Veryan at the piano, Evan Parker on tenor saxophone, Julie Walkington on bass and Jean Martin behind the small drum kit, these masterly improvising musicians were an integral part of the equation and at all times sympathetic to the ever-changing moods of the choir – one minute an ethereal murmur, the next a blood-curdling shriek, utopia morphing into dystopia in a flash. Birdsong, jungle noises, heavenly harmonies, angry dissonance, seething rhythms, beautiful calm – all these elements figured in the ever-evolving and unpredictable story. Not for nothing is it called the Element Choir. It was all perfect unisons in Part 2, the angelic voice of Iris Ederer ( augmented by the 12-piece mixed choir as the series of quotations drew to a close ) floating on top of an infectiously grooving rhythm section in 5/2 time. The same time-signature prevailed in Part 3 but here there are no instruments, the 10-strong female a cappella choir delivering their statements as a series of interlocking and overlapping pentatonic scales. The small audience erupted at the end of this magical piece making 30 people sound like 300, which just goes to show that magic truly can happen. I left the church overwhelmed, enriched and cleansed by the whole evening’s experience and would like to thank Veryan, Iris, Evan, Julie, Jean, Phil Minton ( the things he does with his vocal chords are just mind-boggling ), Christine and all the members of the London Element Choir ( only formed that afternoon, they followed Christine’s multiple gestures and hand-movements to perfection at all times ) for making such wonderful, awe-inspiring, original music. To learn more about Veryan Weston’s theories and compositional techniques visit www.veryanweston.weebly.com . His preview of the concert is HERE.